Northern stories and culture are at the heart of this kids' show. Many millennials will remember the silly Canadian kids show, "Big Comfy Couch," with Loonette the Clown and her doll, Molly, who solve everyday problems on their, well, big comfy couch. 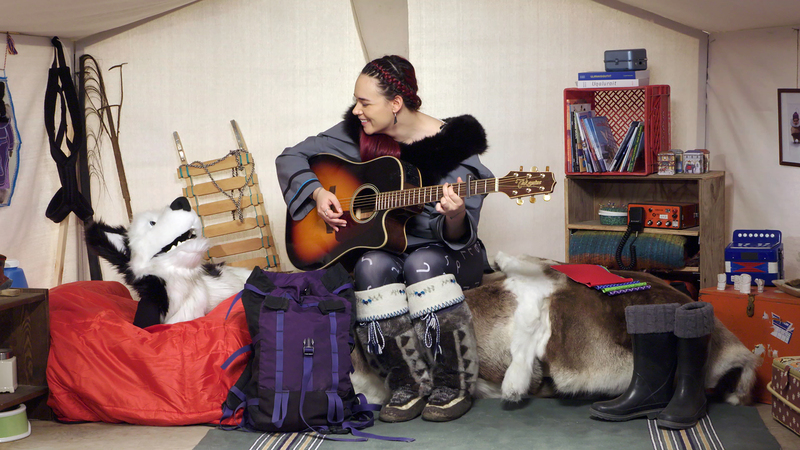 Enter "Anaana's Tent," a children's show that airs in Inuktitut and now in English, starting Saturday. It also takes kids on a journey filled with puppets and storytelling, and teaches them an Inuit language at the same time. Rita Claire Mike Murphy, a performer from Pangnirtung, Nunavut, her trusty sidekick puppet husky, Qimmiq, and a cast of special guests present Northern stories through a mix of live-action and animated segments. They sing songs, play games, read stories and learn and teach viewers new words. At its heart, "Anaana's tent" is about language and culture. Rita Claire Mike-Murphy plays guitar for Qimmiq in. The producers said the show is a response to a problem they were seeing pop up in Nunavut. Children were speaking fluent Inuktitut at home, and speaking it well, until they started watching television. "We recognized television as being a contributor to language loss and cultural erosion," said Neil Christopher, one of three executive producers on the show. "We did some research and thought maybe we could use it as a positive tool to help us strengthen language, knowledge and cultural identity." Executive producers Louise Flaherty, Daniel Christopher and Neil Christopher, who founded Taqqut Productions Inc., an Inuit-owned production company, wanted Inuit children to see themselves on screen. "It's as if almost all the great things are happening somewhere else in the world because that's what you see on television," Neil Christopher told HuffPost Canada. "We wanted them to see themselves front and centre; that can be a very powerful experience." The Inuktitut-only version of the show premiered in May on APTN, while the newly debuted English-language version of the show teaches kids Inuktitut words here and there. The latter version is for those Inuit and others whose first language isn't Inuktitut but want to learn, Neil Christopher said. Learning your traditional language as an urban Indigenous person can be difficult when you're not surrounded by the language. Lizz Steinberg hopes the show will help bring Inuktitut to her family. Lizz Steinberg, an Inuit stay-at-home mom, said that although her mother spoke Inuktitut as a young girl, when she moved to the city, she lost her language. Steinberg hopes "Anaana's Tent" will play a part in bringing language back to her family, especially with her son and baby on the way. "He's only three, but I would love for him to be able to sit down and watch it, and learn the words." Montreal-born Steinberg has been trying to teach herself Inuktitut through an app on her phone. After she learns a new word, she tries to teach it to her son, but she said it isn't catching on. "He kind of looks at me and is like, 'What, Mom?'" said Steinberg. Steinberg said that she will be streaming "Anaana's Tent" online as soon as she can. "I'm excited to learn more, and I'm excited for other people to learn! I can't wait to see it, I hope other people see it too, but I especially can't wait to show it to my son." In addition to helping Inuit kids reclaim their language and be seen, there's a developmental boost kids can get from watching the show. "Research suggests that learning any other language is beneficial for children," Neil Christopher said. "So why not learn a few words, or learn how to count in Inuktitut? There are only benefits." The show airs Saturday and Sunday mornings on APTN and can also be streamed online in Canada at aptn.ca/kids/anaanas-tent. Video clips in Inuktitut and English are also available on the show's website.